Open, light-filled rooms, minimalist furnishings, and the natural OAK hardwood floor in brushed, naturally oiled Vulcano Medium by mafi lend this home in Düsseldorf, Germany a sleek, urban aesthetic. The Medium Vulcano finish results in colors ranging from light to dark brown, further emphasizing the beautiful look of the natural hardwood floor. Some spaces were not meant for open-plan living, but others have such a complex layout and unusual structure that adding walls to make square boxes for rooms just doesn't work. This often applies to spaces created out of a building's attic. 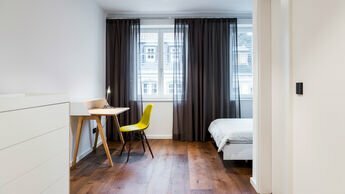 In Düsseldorf, the interior designers at Raumfabrik Konzept- und Ideenschmiede GmbH have transformed such a space using mafi's natural OAK hardwood flooring in brushed, naturally oiled Vulcano Medium to create a perfect example of open-plan living. The large skylights in the angled roof flood the space with light, a feature further supported by the white walls. 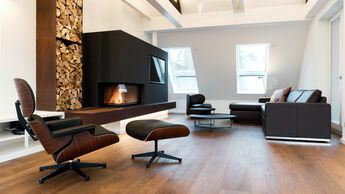 The interplay of the dark furniture with the mafi hardwood creates a strong foundation. The Medium Vulcano finish results in colors ranging from light to dark brown, further emphasizing the beautiful look of the natural hardwood floor. Over time, the floor will develop a beautiful patina in response to the direct light. If owners so choose, this can be counteracted with the help of the mafi care line. To color the wood in tones ranging from light to dark, mafi Vulcano thermal treatment works without any chemical additives. Instead, the boards are gently "baked" in an oven to color both the top and bottom layers all the way through. The advantage of this method is immediately obvious when dealing with the inevitable scratch: since the entire board has turned the same color, the scratches do not destroy the uniform appearance of the plank. Last but not least, the dark shades create a domestically sourced, sustainable alternative to tropical woods, meaning fewer trees will be cut down and shipped long distances to furnish our homes. 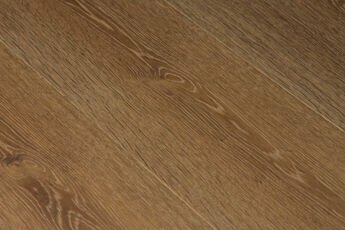 Oak Vulcano Medium closes the gap between untreated oaks and the dark brown tint of Vulcano oak. Medium is a soft brown tone that makes the attic bright and vibrant, without having to sacrifice the noble character of a dark wooden floor. The floor has isolated knots to underpin the natural look. The touch and feel haven't been neglected either: the Oak Vulcano Medium wide board is refined with mafi's natural hardwood oil based on linseed oil to retain its natural wood surface.